Which fresh food sold in Brazil has been found most likely to present “irregular” pesticide residues — levels higher than those permitted by regulation, or even residues of pesticides banned or not authorized for use on the foodstuff it is found on? Peppers. In 2008 more than 64% of the pepper samples analyzed by the National Sanitary Control Agency’s (Anvisa) Program for Analysis of Agrotoxic Residues in Food (PARA) presented irregularities. Next in line were strawberries, grapes and carrots, with residue irregularities found in over 30% of samples. When releasing the 2008 test data today, Health Minister José Gomes Temporão and Anvisa Director José Agenor Alvares underlined the importance of Anvisa’s work for understanding the chemicals Brazilians are being exposed to in their food supply, which pesticides are being used improperly or illegally in Brazilian agriculture, and which pesticides rural workers might be exposed to without proper protective equipment and practices. [On this last point, the reasoning that if a pesticide is authorized only for use on fruit A, but is being used in cultivation of fruit B, workers in fruit B fields may not be properly trained and protected for the pesticide in question.] When pesticide residue data does not match authorized uses and levels, relevant agricultural and environmental authorities are alerted to track and solve the problem, and sometimes a review of pesticide authorizations and registrations can be triggered. In 2008 Anvisa took 1773 samples of 17 food types: lettuce, potatoes, strawberries, tomatoes, apples, bananas, papayas, carrots, oranges, pineapple, rice, onions, beans, mangoes, peppers, cabbage and grapes. Overall, 15.28% presented unsatisfactory results. Tomatoes showed the most year-to-year improvement: in 2007 this category showed 44.72% irregularity; in 2008 it was down to 18.27%. Another major improvement: potatoes, which in 2007 showed 22.2% irregularity, but in 2008 dropped to 2%. The two newest foodstuffs analyzed, rice and beans (staples of Brazilian daily meals), showed indications of irregularities of 3.68% and 2.92% , respectively. These two categories, along with apples, bananas, mangoes, onions and potatoes presented the lowest levels of irregularities in 2008.
Notable were findings of banned or highly restricted pesticides — such as acephate, methamidophos, and endosulfan — in unauthorized use on crops such as pineapple, lettuce, rice, potatoes, onion, carrot, orange, papaya, strawberries, peppers, cabbage, tomatoes and grapes. Testing for the residues of 167 pesticides is done primarily by laboratories at the Octávio Magalhães Institute (IOM/FUNED/MG), the Central Laboratory of Paraná (LACEN/PR) and the Technology Institute of Pernambuco (ITEP). In choosing which foodstuffs will be sampled, Anvisa considers their importance for the average Brazilian diet, and data on food consumption, pesticide use and the distribution of crops across Brazil. As a result of such analysis, in 2008 Anvisa added beans, cabbage, grapes, mangoes, onion, peppers, pineapple and rice to the monitoring list. Hold meetings in the States with oversight bodies in health and agriculture and representatives of supermarkets, farmers, prosecutors and civil society, leading to the establishment of joint actions. Reassess active ingredients of toxicological significance evidenced based on PARA results. Strengthen the network of reference of Public Health Laboratories for monitoring pesticide residues in food. Expand the quantity of samples and the diversity of crops involved in the PARA. 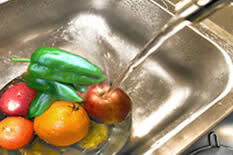 Further expand the strategies in the States for the traceability of fresh products. Encourage the structuring of rural technical assistance to improve production quality. Organize and promote activities and educational campaigns aimed at all social actors involved in the production chain of fruits and vegetables, from farm workers to consumers. Develop a commented version of the technical memorandum on PARA for dissemination through direct communication channels with society. Include PARA actions in the Integrated Plan of Health Surveillance of Populations Exposed to Pesticides of the Health Ministry’s (MS) Secretariat of Health Surveillance (SVS). Partner with the National Institute of Colonization and Agrarian Reform (INCRA), through the Technical, Social and Environmental Advisory Program (ATES) of the Directorate of Rural Settlement Development Project. Define the actions to be undertaken in relation to the active ingredients that had higher frequency of irregularities and for crops with a large number of unsatisfactory results. Strengthen the government programs that already exist, such as those on integrated production (PI) and organic production. Ask the Ministry of Agriculture (MAPA) to adopt measures to limit the import of pesticides that are found by PARA despite severe international restrictions, and whose import levels are above the historical ceiling. Encourage the integration of actions for the monitoring of pesticide residues carried out by different public institutions, federal and state governments. Expedite the publication of technical standards for plant crops with insufficient support and organic food products. Integrate regionally the inspection actions of sanitary vigilance services and MAPA. Inform MAPA and the Federal Police of the presence of banned pesticides in the country, found in crops examined by PARA. Strengthen PI shares through dissemination of its benefits for sustainable agriculture, to professionalize the industry through the adoption of technology and training. Encourage and increase the scale of operation of Integrated Agricultural Production Systems (SAPI) and organic production projects as part of public policies, such as including their products in the school lunch program. Encourage and support the MAPA’s Pro-Organic Program to increase the supply of products that do not use pesticides. O pimentão foi o alimento que apresentou o maior índice de irregularidades para resíduos de agrotóxicos, durante o ano de 2008. Mais de 64% das amostras de pimentão, analisadas pelo Programa de Análise de Resíduos de Agrotóxicos em Alimentos (PARA) da Agência Nacional de Vigilância Sanitária (Anvisa), apresentaram problemas. O morango, a uva e a cenoura também apresentaram índices elevados de amostras irregulares, com mais de 30% cada. No lançamento dos dados do Programa, nesta quarta-feira (15), em Brasília (DF), o ministro da Saúde, José Gomes Temporão, destacou a importância do trabalho da Anvisa no monitoramento de resíduos de agrotóxicos em alimentos. “No Brasil, a segunda causa de intoxicação, depois de medicamentos, é por agrotóxicos, o que tem uma dimensão importante”, afirmou Temporão. Os desvios detectados pelo PARA foram: teores de resíduos de agrotóxicos acima do permitido e o uso não autorizado para determinadas culturas. No balanço geral, das 1773 amostras dos dezessete alimentos monitorados (alface, batata, morango, tomate, maça, banana, mamão, cenoura, laranja, abacaxi, arroz, cebola, feijão, manga, pimentão, repolho e uva), 15,28% estavam insatisfatórias. A cultura de tomate foi a que apresentou maiores avanços quanto à diminuição dos índices de irregularidades. Em 2007, 44,72% das amostras de tomate analisadas apresentaram resíduos de agrotóxicos acima do permitido. No último ano, esse número caiu para 18,27%. 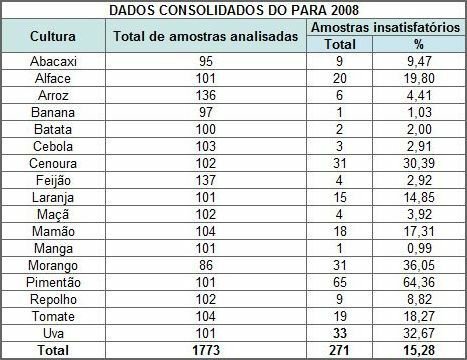 O arroz e o feijão, coletados pela primeira vez no Programa de 2008, apresentaram índices de irregularidades de 3,68% e 2,92% respectivamente. Juntamente com a manga, batata, banana, cebola e maçã, esses dois alimentos apresentaram os menores teores de irregularidade detectados. A batata, que em 2002, primeiro ano de monitoramento do Programa, apresentou um índice de 22,2% de uso indevido de agrotóxicos, teve o nível reduzido para 2%. A banana, que chegou a apresentar índice de 6,53% neste período, fechou 2008 com incidência de 1,03% de irregularidades. Chama atenção, nos resultados do Programa, o uso de agrotóxicos não permitidos, em todas as culturas analisadas. Ingredientes ativos banidos em diversas partes do mundo, como acefato, metamidofós e endossulfam, foram encontrados de forma irregular nas culturas de abacaxi, alface, arroz, batata, cebola, cenoura, laranja, mamão, morango, pimentão, repolho, tomate e uva. Para reduzir o consumo de agrotóxico em alimentos, o consumidor deve optar por produtos com origem identificada. Essa identificação aumenta o comprometimento dos produtores em relação à qualidade dos alimentos, com adoção de boas práticas agrícolas. É importante, ainda, que a população escolha alimentos da época ou produzidos por métodos de produção integrada (que a princípio recebem carga menor de agrotóxicos). Alimentos orgânicos também são uma boa opção, pois não utilizam produtos químicos para serem produzidos. Os procedimentos de lavagem e retirada de cascas e folhas externas de verduras ajudam na redução dos resíduos de agrotóxicos presentes nas superfícies dos alimentos. O objetivo do PARA, criado em 2001, é manter a segurança alimentar do consumidor e a saúde do trabalhador rural. O Programa, coordenado pela Anvisa em conjunto com os órgãos de Vigilância Sanitária Estaduais e Municipais, abrange, atualmente, 25 estados e o Distrito Federal. Em 2008, realizaram coletas em supermercados (de acordo com o plano de amostragem) os estados do Acre, Bahia, Espírito Santo, Goiás, Minas Gerais, Mato Grosso do Sul, Pará, Paraná, Pernambuco, Rio de Janeiro, Rio Grande do Sul, Santa Catarina, Sergipe, Tocantins e Distrito Federal. Neste mesmo ano, as ações de ampliação do Programa treinaram os estados de Amapá, Amazonas, Ceará, Maranhão, Mato Grosso, Paraíba, Piauí, Rio Grande do Norte, Rondônia, Roraima. Os dez estados treinados, mais São Paulo, participarão do PARA em 2009. A escolha dos itens analisados pelo Programa leva em consideração a importância destes alimentos na cesta básica do brasileiro, o consumo, o uso de agrotóxicos e a distribuição das lavouras pelo território nacional. No último ano, o PARA acompanhou oito novas culturas, até então nunca monitoradas: abacaxi, arroz, cebola, feijão, manga, pimentão, repolho e uva. O Programa funciona a partir de amostras coletadas pelas vigilâncias sanitárias dos estados e municípios. No último ano, as amostras foram enviadas para análise aos seguintes laboratórios: Instituto Octávio Magalhães (IOM/FUNED/MG), Laboratório Central do Paraná (LACEN/PR) e Instituto Tecnológico de Pernambuco (ITEP), nas quais foram investigadas até 167 diferentes agrotóxicos. Caso a utilização de agrotóxicos esteja em desacordo com os limites permitidos pela Anvisa, os órgãos responsáveis pelas áreas de agricultura e meio ambiente são acionados para rastrear e solucionar o problema. “Trabalhadores rurais são expostos a estes agrotóxicos sem os equipamentos próprios para o manejo destes produtos”, explica José Agenor Álvares, diretor da Anvisa. As medidas em relação aos produtores são, principalmente, de orientação para que sejam adotadas as Boas Práticas Agrícolas (BPAs). Realizar reuniões nos Estados, com os órgãos de vigilância sanitária e agricultura e os representantes dos supermercados, dos produtores rurais, do Ministério Público e da Sociedade Civil para o estabelecimento de ações conjuntas. Reavaliar ingredientes ativos de importância toxicológica evidenciada pelos resultados do PARA. Dar continuidade às ações de fortalecimento da rede de referência de Laboratórios de Saúde Pública para o monitoramento de resíduos de agrotóxicos nos alimentos. Continuar ampliando o quantitativo de amostras e a diversidade das culturas envolvidas no PARA. Seguir ampliando as estratégias junto aos Estados para a rastreabilidade de produtos in natura. Fomentar a estruturação da assistência técnica rural para aprimorar a qualificação do produtor. Organizar e fomentar ações e campanhas educativas voltadas para todos os atores sociais envolvidos na cadeia produtiva de Frutas, Verduras e Legumes – dos trabalhadores rurais aos consumidores. Elaborar uma versão da nota técnica comentada para ser disponibilizada nas estruturas de divulgação da Coordenação Geral da Política de Alimentação e Nutrição do Ministério da Saúde e outros canais de comunicação direta com a sociedade. Incluir as ações do PARA no Plano Integrado de Vigilância e Saúde de Populações Expostas a Agrotóxicos da Secretaria de Vigilância em Saúde do Ministério da Saúde. Estabelecer parceria com o Instituto Nacional de Colonização e Reforma Agrária (INCRA), por meio do Programa de Assessoria Técnica, Social e Ambiental (ATES) da Diretoria de Desenvolvimento de Projetos de Assentamento Rural. Definir as ações a serem desenvolvidas em relação aos ingredientes ativos que apresentaram maior freqüência de irregularidades e para as culturas com grande número de resultados insatisfatórios. Fortalecer os programas de governo já existentes, como o de produção integrada e o de produção orgânica. Solicitar ao Ministério da Agricultura a adoção de medidas que limitem a importação de agrotóxicos que são encontrados pelo PARA apesar de terem severas restrições internacionais, e cujos níveis de importação estão acima do teto histórico. Fomentar a integração das ações voltadas para o monitoramento de resíduos de agrotóxicos efetuados por diferentes instituições públicas, federais e estaduais. Agilizar a publicação de normas técnicas para as culturas com suporte fitossanitário insuficiente e para os produtos destinados à produção orgânica de alimentos. 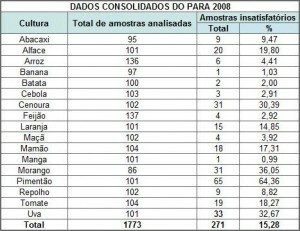 Integrar regionalmente as ações fiscalizatórias das Vigilâncias Sanitárias e das Secretarias de Agricultura. Informar o Ministério da Agricultura e a Polícia Federal quanto à presença de agrotóxicos proibidos no país, encontrados nas culturas analisadas pelo PARA.